access the full complimentary course, with the form below! Through high tech processes (like steam distillation or cold pressing), the essence is extracted and bottled. This aromatic and concentrated liquid is called an essential oil. When extracted properly, the essence that protected the plant, also provides therapeutic qualities to the human body (physically, mentally, and emotionally). This highly effective method, of diluting essential oils and rubbing them on the skin, allows the tiny essential oil molecules to be absorbed into the bloodstream. We are also benefiting from the essential oils aromatically, as that potent aroma travels up to the nose! 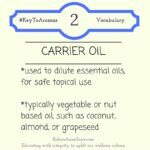 Applying essential oils to the skin is typically done with the use of a carrier oil. When starting out, it’s perfectly acceptable to grab whatever oil is in the pantry. However, every body will respond differently and you’ll start to find what leaves your skin the most nourished. 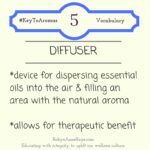 A diffuser is a clever device to utilize the aromatic benefits of essential oils in the home, office, or even the car! Ultrasonic technology disperses essential oils and water into the air, as it purifies and neutralizes odors. Something else awesome? Diffusing essential oils may help with mood regulation! Traveling, and there’s no diffuser nearby? No worries! 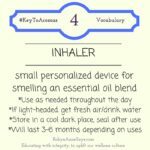 Direct inhalation is a fantastic method for using essential oils. – Place 2 drops into the palm of your hand; rub with the other hand. Cup hands together over the nose and mouth and inhale deeply. – Apply a few drops of essential oil to a cotton ball, tissue, or clay necklace, and inhale periodically. – Add 2 drops of an essential oil to a bowl of hot (not boiling) water. Inhale the vapors that rise from the bowl. A towel can be placed over the head and bowl to increase the intensity of the vapors. Though essential oils are touted as a pleasant perfume, they can actually be used as a perfume with purpose! One interesting factor in aromatherapy (the use of essential oils to provide comfort in our daily lives), is that there are various therapeutic possibilities for each essential oil. For example, one essential oil (let’s say, peppermint) may provide an invigorating atmosphere when diffused in the morning, comfort a late afternoon headache when inhaled from the bottle, and also ease digestive discomfort, from a late night raiding of the fridge, when applied topically. The chemical structure of each essential oil varies from plant to plant (Don’t worry, you don’t need to understand the science to benfit from essential oils! ), which is why the therapeutic value varies among essential oils. Factors such as plant part (leaves, fruit, flower…) and growing conditions (climate, soil, time of harvest…) determine each essential oil’s unique attributes and characteristics. Starting gradually is a key to safety, when beginning to use essential oils in everyday activities. While I am a certified aromatherapist, I am not your doctor or pharmasist. Consultation with your healthcare providers is always recommended. They are pretty cool people with a lot of information. Some even specialize in ways to incorporate essential oils & other natural products into your wellness regimen! What else would you like to know about essential oils? Looking forward to checking in with you, via weekly emails! 1) Provide your name and email for instant access to SHORT videos. 2) If you find value in the videos, check your email & confirm that you'd like to receive future essential oil emails.